Hello everyone! I’m finally on holidays and back to blogging regularly, YAY!! Since summer is well and truly here, I thought this would be the perfect time to share with you some summer trends I’m looking forward to wearing this summer. But if you’re going into fall / winter then don’t worry because I’ve collabed with a few other bloggers who have your back with all things fall. Read till the end for summer inspo and then hop over to their posts (links at the end of this post) for some fall inspo! I’m a massive fan of denims during the summer. 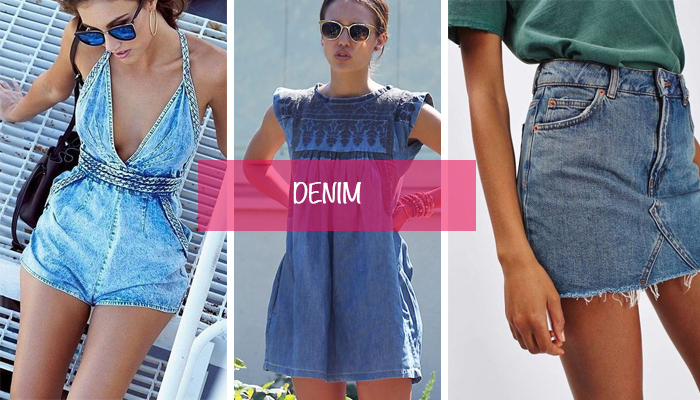 Winter is all about denim jeans but for the summer, it’s the denim shorts, skirts, dresses and playsuits. I’ve recently been obsessed with denim dresses (click here to find out where to get the CUTEST denim dress from). Last year, towards the end of summer, I bought a sheer skirt with a solid skirt under it. I haven’t had the chance to wear it as it only just recently got hot but I’ve been a massive fan of this trend. I love this trend for the summer because I think it’s the perfect combination of elegant and light. There’s just something really flattering about clothes with high necks. I love the style of the first playsuit! These are the perfect outfit for the summer as they have that flattering neckline without any sleeves for the warm summer. How cute are these culottes! I love the flowing style of culottes for the summer as they’re airy but super stylish. Paired with a sleeveless top, they will be the perfect summer outfit! One of the things I look forward to during the summer time is pairing shorts, playsuits, dresses and so on with cute summer sandals. I love all these three sandals as they either have pops of colour or are simple to dress up and down – especially the first one with the gorgeous blue for the summer. As I mentioned at the start of this post, this post was in collaboration with a few other lovely bloggers who blogged about Fall. If you’d like check out posts from fall to fall fashion to other fall related posts, check out the links below! What are your favourite trends for the Summer or wherever you are?